The title of this article can mean different things to different people and thereby add to the mystique surrounding the entire field of metal detecting, for that is what “Electronic Treasure Hunting” is all about. The word electronic should mean the same to everyone. What goes on in that metal box may be a mystery to most of us, but we all know it isn’t magic. The vast assortment of transistors, resistors, capacitors and various integrated circuits add up to a very sophisticated type of transmitter which broadcasts a signal through the transmitting coil of copper wire contained in the disc or loop at the front-end of the detector. This signal is affected by the electromagnetic field which is present around all metal objects. Thus, when it returns to the receiver-coil in the loop, this signal is changed. The change is interpreted by the complex circuitry in the detector box and lets us know that there is metal out there. Depending upon the sophistication of the detector, this data can include the possible type of metal, depth of the item and even the shape or identity of the metal object. This may be an over-simplification of what goes on, but we need not worry about how it happens. Let the engineers who invent these devices handle that. The thing to remember is, metal detectors find metal. There are variables that create differences between detectors, and these variables will determine which style of detector is best-suited to the type of treasure hunting that we wish to do. This brings us to the second part of the title of this article: Treasure Hunting. As I mentioned, this is the part that means different things to different people. To some, it means looking for dropped coins or jewelry in various places such as parks, playgrounds, backyards, beaches, picnic grounds or even old ghost towns. The locations change and the technique for searching varies a great deal, but the basic function of the detector to locate metal is the same. Some consider treasure hunting to be locating caches of buried coins or valuables, even sunken galleons. Again, the treasure and the location change, but the detector is still operated as it is de- signed, to locate metal objects. To others, treasure hunting takes the form of searching old battle sites or ghost towns for relics of days gone by. And yet, another select group of treasure hunters who call themselves “prospectors” direct their search for the elusive nuggets of gold, long sought by man to be used as a measure of wealth. By now I hope it has become apparent that the common denominator linking most treasure hunters together is the electronic metal detector. The location may change and the targets may differ, but all respond to the initial function of the detector to find metal. It is only necessary to vary where we look, and to some degree, develop special skills unique to each type of treasure in order to change from coin shooter to cache hunter to relic hunter to prospector. This might be a good time to clear up one particular misconception, one that has been brought to my attention hundreds of times over the years by those unfamiliar with treasure hunting. That is, the idea that metal detectors cannot find GOLD. This stems from some misunderstanding about the nature of gold. When I have questioned these people, I have found that most were not really sure if gold was a metal or not. Some had a vague idea that gold might be classed as a mineral. Most, however, were not sure what the difference was between a metal and a mineral. In brief, the difference between a mineral and a metal is that a mineral is a chemical compound of more than one element, and a metal exists in its pure state as a single element. So, let’s just accept the fact that iron, copper, lead, silver, and GOLD are all metals and can be found free in that form, and that all of them can be located with a metal detector. We can surely begin to see why such mystery surrounds gold and gold prospecting, as well as treasure hunting in general. 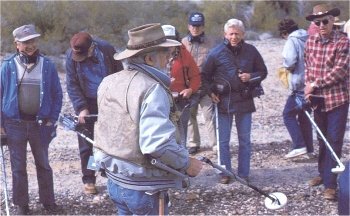 I do not mean to imply that electronic treasure hunting or prospecting is as easy as falling off a log; only that it is not magic, and that the skills acquired while learning to hunt coins in a park with a detector are the same skills used when prospecting for gold nuggets in the Mohave Desert. The target and the location change, but the basic skill is only varied by the different types of hunting. Up until several years ago, one of our most successful coin shooters from the Sacramento area in California had never seen a gold nugget except at the various gold shows where suction dredgers show off the treasures which they find at the bottom of streams and rivers. He had acquired the necessary skills over the years in the operation of his detector. He had learned to utilize the ability of his detector to cancel-out the ground mineralization caused by iron ore and salts which mask the ability to locate metal objects such as coins. He had trained his ear and slow searching techniques to hear those deep older coins. When he decided to give a shot to gold prospecting, he had little else to learn. He was successful right from the start. Of course, he didn’t look for the nuggets in the local park. But, he did find his first nugget in a dry streambed not more than 15 minutes from his house. He was bitten by the gold bug on that first day and will never be the same! His biggest problem was to find a good place to hunt. He rightly concluded that the best place to start was where the old 49ers had found gold. If it was there then, it was surely there today. He was right. He began by going over the tailings left behind by old-timers. Gold was plentiful and the old methods of recovery were not perfect. Carelessness and lack of skill left plenty behind. He researched old maps and history books to seek out previous diggings. Sometimes, he went over old tailings. Other times, he searched dry washes and gulches near the diggings. Experience sharpened his skill and techniques, just as those many hours spent in the old parks had prepared him for this new approach to treasure hunting. Averaging three days per week searching, he found more than 40 ounces of gold last year! I do not want to paint too rosy of a picture here. The fellow mentioned above is a real experienced detectorist. He spends time hunting and looks for the right spots. Few of us will measure up to his success. But most who try their hand at treasure hunting will be pleasantly surprised at how fast they can become skilled in the use of this electronic device. Practice and patience are all that are required. Skill in tuning and operating the detector comes from reading the manual carefully and asking information from the dealer that sold the unit. Other users are a good source for acquiring special helps in learning to use the unit. I, as well as others, have written articles and books explaining in detail the tuning and searching techniques of metal detecting. Joining up with others in a Club or association will gain you very valuable access to experience and places to hunt for golden treasure. One of the unpredictable ingredients in the creation of a successful treasure hunter is LUCK!! The old adage that you have to be standing over a target to find it, is true. My friend and I were searching an old baseball field a number of years ago which was adjacent to an old Mission. We both found numerous coins, many silver, but all from this century. I was lucky enough, however, to find a 1778 Spanish half real dating back to the Mission Period. It was only 4 1/2 inches or so deep. It was luck. I was practicing the same learned skills as my partner and we both were successful. My old coin was there because I was standing over it. I have a good friend with whom I prospect. We dig a lot of targets in order to find the elusive gold nugget. I have found many nuggets, most in the tiny-to-small size-range, but none really large. However, along with many smaller nuggets, this fellow has found a 6-ounce, a 9-ounce, and a 12-ounce piece of Mother Nature’s natural golden treasure. Granted, he hunts for gold nuggets a lot more than I do, but many who hunt as often as he does never find nuggets in that class. Wouldn’t you say some luck came his way? Each one of these nuggets was found with a different make and model of detector. Many detectors are pretty equivalent in ability to find metal, but all metal detector users are not equal in skill — or in luck. Another example comes to mind at this time: This one might seem pretty far-fetched, but it is true. A few months ago, a prospector-friend of mine called to announce that he had just found his largest nugget to date. It was a ¾-ounce piece, that’s 15 pennyweight. Now, that is a respectable nugget. Of course, he said he found it with the help of his faithful dog. You might call the dog his gold-hound at this point. While my friend was prospecting along the bank of a popular river, his dog was doing his duty near the water. As he noticed his dog scratching at the sandy shore, he caught a glimpse of something flashing in the sunlight. He went closer to investigate and spotted the aforementioned nugget with loop and all attached. Some luckless prospector had lost his prized specimen from around his neck. One man’s loss is another man’s gain, as they say. It goes without mention that this is one dog that will never want for attention again! We have talked about learning how to use the detector, regardless of what the object of your search is. There is no substitute for expertise and skill. We have mentioned that buying the proper detector is essential and we have pointed out that a certain amount of good luck doesn’t hurt. The final ingredient is good old perseverance and perspiration. My basic intent in this article is to clear away some of the magic from electronic metal detecting and show it as an acquired skill, which is what it really is. It is important to buy the best detector you can; one that has the ability to cancel the ground-mineralization. This is most important if you plan to use the detector for prospecting, because gold and silver are most-often found in highly-mineralized soil. If you are going to use the detector in trashy areas (lots of man-made metal objects), you should buy a detector that has some ability to identify trash. Otherwise, you will have to dig every target that sounds off. This is not only tiring; but since you can only dig so many targets in a day, it diminishes the odds of digging good targets. You can see that this would not be important if you were relic hunting, where all items are potential treasures. But it is more important when coin hunting, where pull tabs and bottle caps are not desired, or in prospecting, where nails and tin cans left from former miners are tedious to dig and not as valuable as gold nuggets. Of course, if the area is virgin, one would not have a need for identifying trash. Being able to identify a “hot rock” (a rock with different mineral content than the surrounding terrain) is also an important feature to be looked for in a detector to be used for prospecting. Have your dealer help you pick a detector best-suited for your needs, whether they be specialized or multi-purposed.